John Rawlings was my pastor. I was saved (1961), baptized, and called to preach under his ministry at Lockland Baptist Church/Landmark Baptist Temple in Cincinnati. I grew up in the church (with my siblings Don, Debra, and Joe) and fondly remember not only Mrs. Rawlings, Herb, Harold, Carrol, and George, but many of the people mentioned in the book, especially Dr. Humphries and Bill and Phyllis Aven (they were our youth pastors). I was drawn back to the church at age 16 because of a loving youth group which included my best friends, Larry Groves and Geary Randall, the latter becoming the church pianist after our college years. I worked as youth pastor at Landmark for a couple of years (‘75-’76) and had John, Jim, and Cathy (Harold’s kids) in my youth group. Once Dr. Rawlings was your pastor, he was always your pastor. He would call me year after year, even in his 90s, and ask about my parents, brothers and sister, and then encourage me in ministry. 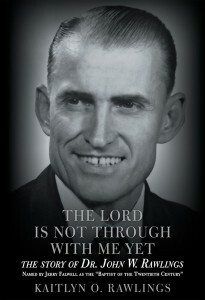 I didn’t always agree with him and he knew that, but I knew he always loved me as a son in the ministry. I thank God for him. I loved him.